Rockside's new dining room catered for more than 200 people at a sitting over the Christmas period of 1924. A new ballroom was also built, "together with a new wing on the Cavendish Road side, giving accommodation for 150 guests". Press reports commented that the growth of Rockside has been enormous. It was then thirty years since the Goodwins had taken over the hydro and the buildings had been extended and improved in the interim. A staff of seventy provided all the comforts for the visitors, compared with ten in the middle Nineties. Advertisements in The Times in the mid to late 1920s were both cheery and inviting. 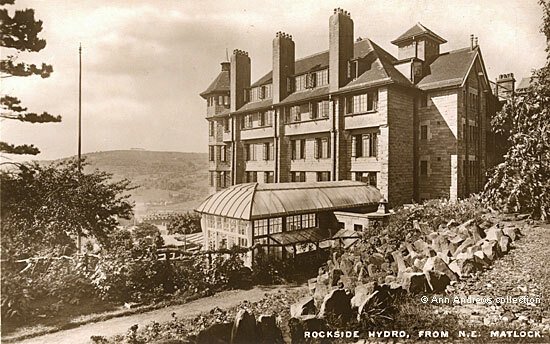 In 1927 Rockside was "The favourite modern hydro for treatment, rest and pleasure ; centrally heated ; entertainer". The following year it had become "the favourite all the year hydro" with a lady entertainer. Plays were performed on the ballroom's stage. In 1933, for example, the Wilmslow Green Room Society of Manchester performed Noel Coward's "Hay Fever". Amongst the other entertainments in the 1930s were whist, bridge, dancing and tennis. An important member of staff was the resident physician Dr. Marie Orme (née Goodwin) who was awarded the MBE in 1920 for her war service. She died on 17 March 1929, aged 62, in rather tragic circumstances and was buried at St. Giles'. At her funeral the Rockside staff lined the paths from the gates to the church door. "Rockside Hydropathic Establishment ; 800 feet above sea level ; illustrated tariff on application. Physician, Nelson Cameron Schlater L.R.C.P.I., M.R.C.S., Eng., D.P.H. Camb. ; consultant, George Leslie Meachim M.B., Ch.B. Manc. Telephone 312". Presumably, advertising the height above sea level was to show that the air was considered very healthy. 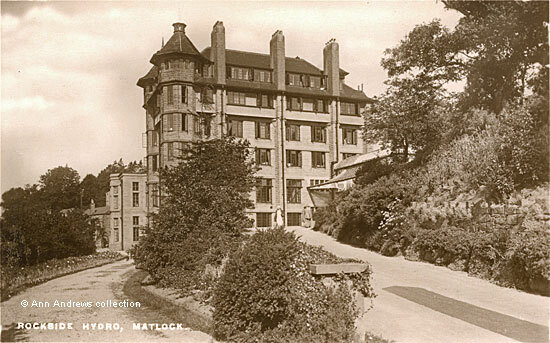 In the autumn of the same year the Matlock Publicity Association sought approval from its members to re-instate the official weather recording station at Rockside, under the auspices of the Meteorological Society, with the object of coordinating Matlock's weather reports that were published in the newspapers. The instrument was already working and on Monday 19 September had recorded 12.40 hours of sunshine. The station had originally been set up before first war. with the work probably done by Henry Ballington who lived nearby. The managing director of Rockside, Miss Annie Eliza Goodwin, died at the hydro on 6th October 1937 in her eightieth year. She had become manager Rockside in 1894 and then managing director when the company was formed. It all came to an end with the outbreak of the Second World War, when Rockside was requisitioned. It was used by the Royal Air Force once more, this time for the entirety of the war. It was turned into a psychiatric hospital for sick airmen, known as "Hatters Castle". Amongst the long term residents who were displaced was the Rev. J. W. Chippett, who for many years owned Riber Castle and ran a boys' preparatory school there. After retirement he continued to live in Matlock, eventually at Rockside. When war broke out he returned to Giggleswick. In December 1945 came the news that, after around fifty years of running Rockside, the Goodwins were selling their hydro. After six years of use by R.A.F. there was some discussion about compensation etc between the owners and the military, but an enquiry about purchasing the premises came along almost before the directors had time to consider reopening the premises as a hydro. Derbyshire Education Committee wanted to turn Rockside into a Teacher Training College. When the Goodwin family agreed to sell it to them, it brought to an end Rockside's long association with hydropathy, which had begun on the site in 1860.
photograph, unlike the top two images. What gives it away is the wall along the Wellington Street boundary. steep entrance, bottom and just right of centre, has never had gates or been accessed through an arch. probably of the 1925 extensions. A coloured version was also printed. There is a picture of Rockside's croquet lawn in the Just Images/Images Only section elsewhere on this website. The Goodwin family appear in the following census returns: 1841 | 1851 | 1861 | 1871 | 1881 | 1891 | 1901. Directory entries included: Kelly's Directory, 1895 | Kelly's Directory, 1899 | Kelly's Directory, 1908 | Kelly's Directory, 1912 (under Goodwin) | Kelly's Directory, 1912 (under Rockside) | Kelly's Directory, 1916 (under Goodwin) | Kelly's Directory, 1916 (under Rockside). 1. "Rockside Hydro, Matlock". Pelham Postcard Real Photo Series, No.7291 - Not posted. 2. Advertisement from Ward Lock & Co's "Matlock, Dovedale, Bakewell and South Derbyshire", Illustrated Guide Books of England and Wales (1932-3). 3. "Rockside Hydro, Matlock Pelham Postcard Real Photo Series, No.9291 - Not posted. 4. Rockside Hydro, Matlock". From S.W. Pelham Post Card Real Photograph Series 3391. Card posted in Manchester on 28 March 1933. Postcards and advertisement in the collection of, provided by and © Ann Andrews. "Derby Daily Telegraph", 8 January 1925. "Derbyshire Times and Chesterfield Herald", 21 December 1945. Prospective use of Rockside Hydro, Matlock. "The Times", 16 Feb, 1927 and other dates. "Derby Daily Telegraph", 12 January 1933. "The London Gazette", 26 March 1920 (supplement published 30 Mar): Marie, Mrs. Orme, L.R.C.P. Commandant, Voluntary Aid Detachment No. 22, Derbyshire. 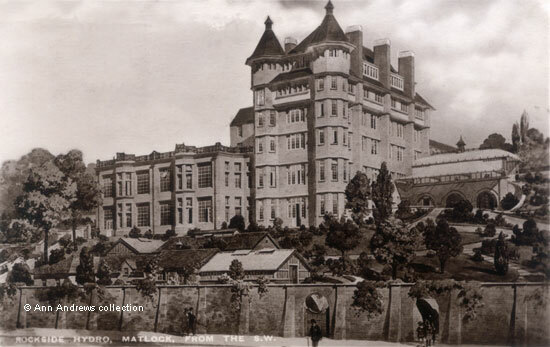 She had been Commandant of the Military Auxiliary Hospital in Darley Dale. The award was also mentioned in Kelly's Directory, 1925. "The Times", Thursday, 21 Mar, 1929. Her funeral was on the 21st March. It was reported in the "Derby Daily Telegraph" on the same date. James Goodwin was listed in the "London Gazette" for several years as a Public Auditor. His address was always given as Rockside. See J. H. Goodwin's stationery in Letterheads of Local Businesses, 1900-1949 (2), E - H.
 "Derbyshire Times and Chesterfield Herald", Sat 24 September 1932. "Derby Daily Telegraph", 30 December 1932. One of the announcements of his death. It is unclear if he did so after the 1903-6 extensions or after those of 1925, although it could have been on both occasions. "Derby Daily Telegraph", 7 October 1937. Also "The Times" of 8 Oct.
 "Derbyshire Times and Chesterfield Herald", 22 August 1941. Notice that he had died at Giggleswick. "Derbyshire Times and Chesterfield Herald", 21 December 1945. Good news for Matlock.